Three of the Most Cost-effective and Fuel-efficient Cars on the Market! Crossover vehicles have really caught on with the public at large and families, in particular. For families wishing for the room of the traditional minivan, but with the power of an SUV, a crossover vehicle is the best bet. On howthingswork.com, Cherise LaPine writes that crossover vehicles have become the family go-to vehicles. She cites five reasons why this has occurred: fresh styling, improved efficiency, competitive pricing, more options and third-row seating. We are delighted to fill you in on the three distinctly different crossover vehicles Nissan offers: the Juke, the Rogue, and the Murano. While the Juke is the smallest of Nissan’s three crossover vehicles, it gives rise to the saying, “Big things come in small packages.” First, its fuel economy blows away its competitors, including the 2013 Kia Sportage EX and the 2013 Hyundai Santa Fe Sport V6. With highway mileage of 32 mpg and city mileage at 27 mpg, the Juke is an excellent choice for those wanting the benefits of a powerful vehicle with all the comfort and look of a luxury car. The Juke’s Xtronic Continuously Variable Transmission (CVT), which uses a belt and pulley system to transmit engine power to the wheels rather than shifting through gears, guarantees the Juke’s engine efficiency for the long run. In addition to fuel economy, Nissan touts the Juke as “Built to Thrill.” And it does! With its powerful 188 hp engine with 177 lb/ft Torque, this baby really moves when you need it to. Its lighter weight (up to 800 lbs lighter than its competition) ensures the fuel economy of the Juke, but the interior legroom is actually greater than the competitors. Pricing on the 2013 Nissan Juke is lower than the average MSRPs of the Sportage and the Santa Fe by almost 20%. Safety is confirmed with the seat-mounted drive side and passenger side airbags as well as 1st and 2nd row curtain airbags, and a vehicle immobilizer system. The Rogue is the middle offering in Nissan’s crossover line. 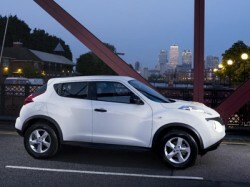 “The Crossover that’s the Perfect Fit,” as Nissan puts it, is priced and sized between the Juke and the Murano. 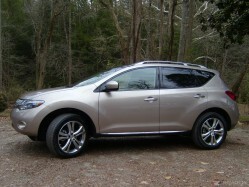 Due to its superb fuel economy (25 mpg combined), it was acknowledged by howthingswork.com as one of the 5 crossover vehicles with the best fuel economy. A list that was admittedly difficult to compile due to the different connotations of the word crossover, How Things Work says, “While the word ‘Rogue’ might conjure up pirates and thieves…the Nissan Rogue crossover plays by the rules and gets great gas mileage in the process.” The Nissan Rogue gets markedly better combined fuel economy than most of its competitors. With a MSRP of over 5% below the average competitors’, the Rogue proves to be a good value as well. Competitors include the Honda CR-V EX-L, the Hyundai Tucson Limited, and the Toyota RAV4 Limited. With its CVT and lighter curb weight contributing to its efficiency and front seats that fold flat, the Rogue satisfies discerning drivers with competence and comfort! Even with its lighter curb weight, the Rogue provides more legroom and headroom than its competition. Nissan says that with the Murano, “Refinement also comes in AWD.” The Murano is the top offering of the Nissan crossover line and is comparable to the Honda Pilot EX-L, the Toyota Venza XLE, and the Toyota Highlander SE V6. The Murano’s 260 hp engine is more powerful than its competitors. However, pricing is much more reasonable on the Murano. With a MSRP starting from $33,530, the Murano is a great value for what is considered a luxury automobile. The 31.8 cubic feet of cargo space is much more spacious than that of Murano’s competitors and makes this car a perfect fit for families. 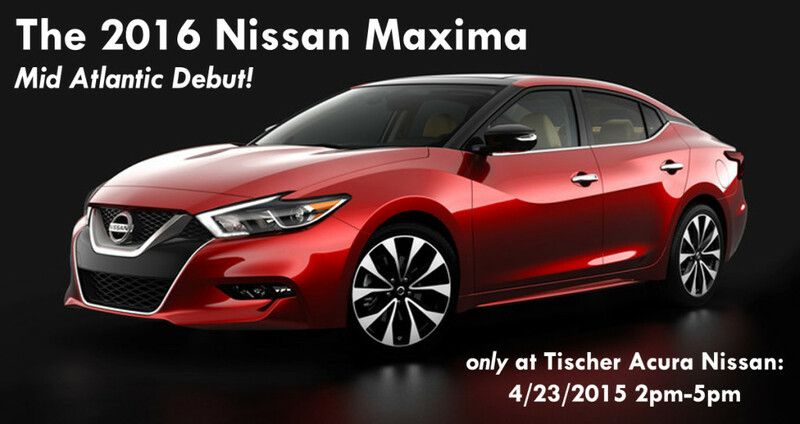 Now that you’ve read all about Nissan’s three crossover offerings, we invite you to come on down and take a look at each of them! Once you test drive one or all of them, we know you’ll love them as much as we do! Schedule your test drive(s) today! Simply click below to schedule your test drive(s) to see what a great driving experience driving a Nissan crossover would be for you!